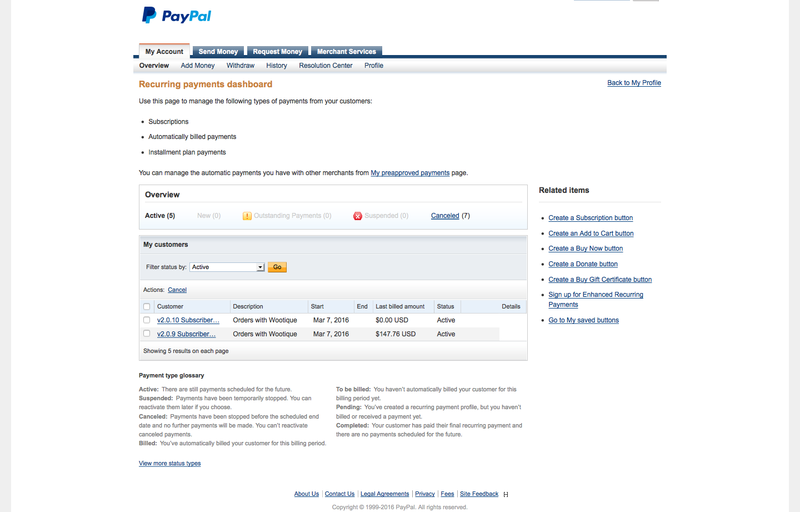 By default Subscriptions uses the first of these – PayPal Standard. This is the easiest to configure. You can sell subscription products with PayPal Standard straight away with a PayPal business account. You do not need any further setup to start receiving recurring payments from your customers with PayPal Standard. If you need to be use any of Subscriptions advanced features with PayPal, including upgrades/downgrades or need to workaround some of PayPal Standard’s limitations, then you will need to apply with PayPal for Reference Transactions. These are required both when using PayPal built-in to Subscriptions, and the PayPal Checkout extension with Subscriptions. Reference Transactions is not a standard product and approval is subject to a fully underwritten application. This can include reviewing your business model and finances to determine your suitability. 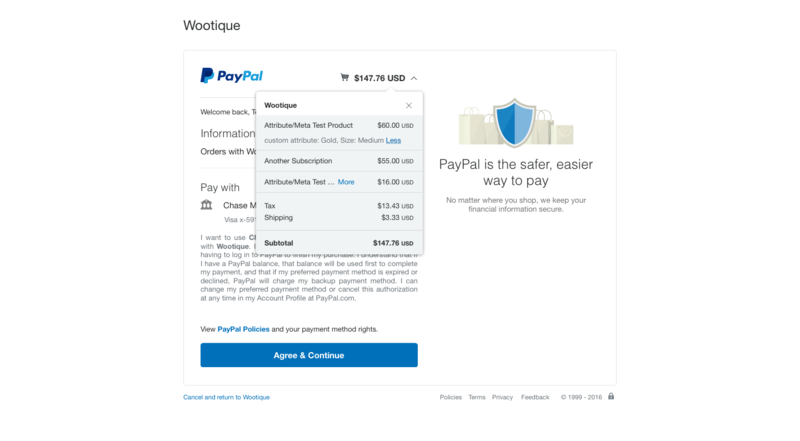 This FAQ answers common questions about getting your PayPal account approved for Reference Transactions, and how PayPal Reference Transactions work with WooCommerce Subscriptions. Tell PayPal that you are specifically calling so a PayPal Specialist can enable Reference Transactions on your account. They may try to help you set up recurring payments with a button — that is not want you want. They need to transfer you to a specialist who will ask you for your PayPal account information (email address), and then tell you that they filed a ticket, and you will hear back from PayPal via email on whether Reference Transactions have been enabled or not. Choose sub-topic: PayPal payment solutions. 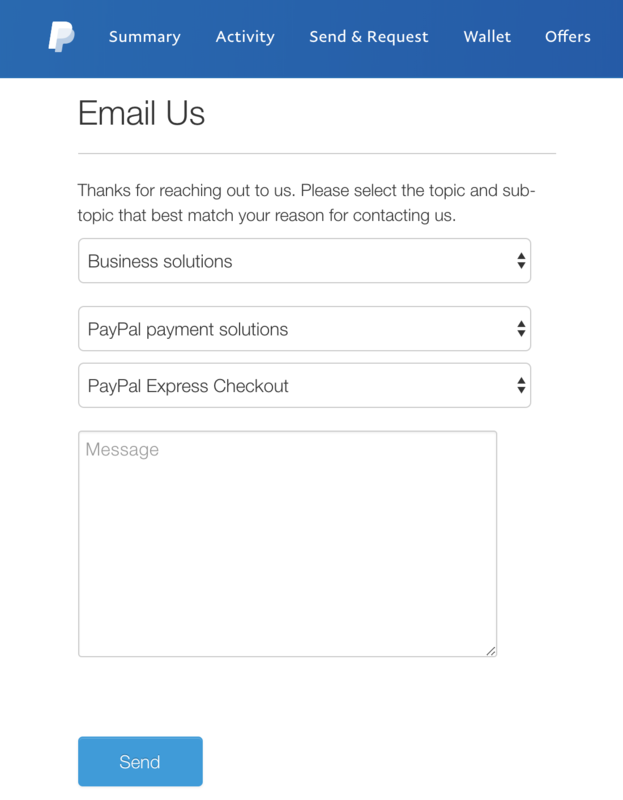 Choose sub-topic: PayPal Express Checkout. I need this feature to sell recurring subscription products via WooCommerce. WooCommerce Subscriptions takes advantage of Reference Transactions when possible. If your PayPal account does not have Reference Transactions enabled, Subscriptions automatically checks with PayPal once a week when loading the WooCommerce > Settings > Checkout screen to see if support has since been enabled. 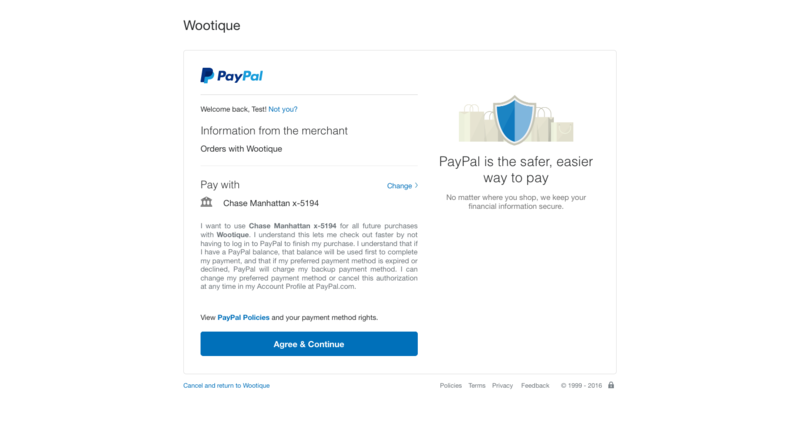 Go to WooCommerce > Settings > Checkout > PayPal. Ensure PayPal is enabled and your credentials are set. 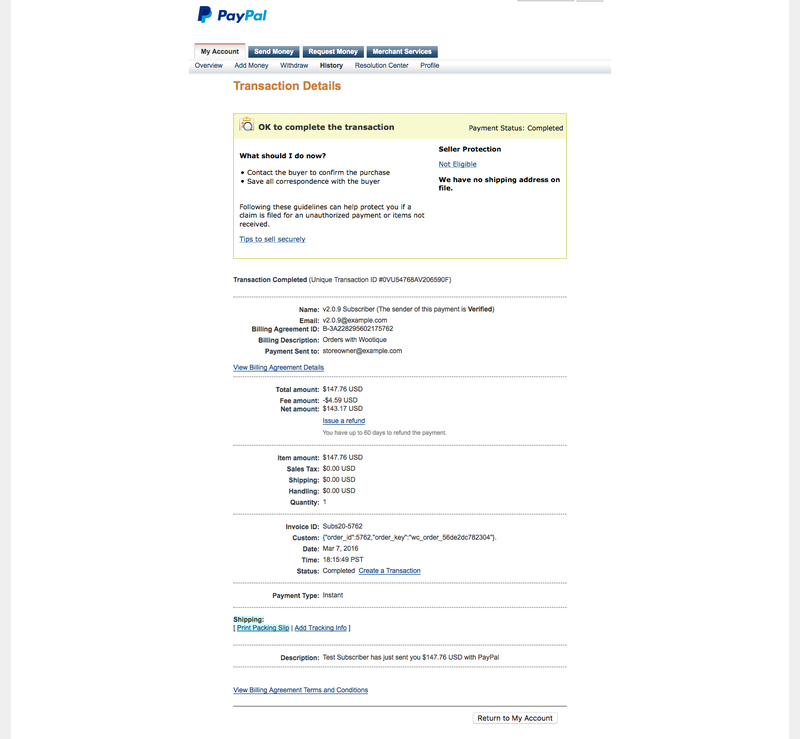 Select Check PayPal Account when the Reference Transaction notice appears. No. Any existing subscriptions continue to be PayPal Standard subscriptions. PayPal Reference Transactions are only used for future subscriptions. This means that advanced subscription management features, such as recurring amount changes, are only possible on newly purchased subscriptions, not existing ones. However, enabling Reference Transactions makes it possible to upgrade or downgrade existing subscriptions. The only way to have existing PayPal Standard subscriptions changed to use PayPal Reference Transactions is to have customers sign-up again with PayPal by changing the payment method on their subscription(s). When a PayPal Standard Subscription is canceled or suspended in your WooCommerce store, status of the corresponding subscription at PayPal is also changed. However, when a subscription created using PayPal Reference Transactions is canceled or suspended in your WooCommerce store, the corresponding Billing Agreement at PayPal does not have its status changed. It remains active. This is normal behavior because Billing Agreements are fundamentally different to PayPal Standard subscriptions. A PayPal Standard Subscription needs to be suspended or canceled because future payments would be processed on that subscription if it were to remain active. For a Billing Agreement, this is not the case. Once a subscription purchased using Reference Transactions has been canceled in your WooCommerce store, no future payments are processed against that billing agreement because Subscriptions no longer requests any payments. Billing Agreements are per store not per subscription. Meaning if your customer has purchased multiple different subscriptions with your store, the same Billing Agreement ID is shared between all of those subscriptions. If it were to be canceled when one subscription is canceled, all other subscriptions would be unable to continue. Billing Agreements can be manually added to a manually created subscription or even used to undo cancellation of a canceled subscription (impossible to do with PayPal Standard Subscriptions), but only if the billing agreement remains active in PayPal. For these reasons, it is recommended that you do not cancel Billing Agreements manually at PayPal. If your customer chooses to cancel their Billing Agreement at PayPal, Subscriptions handles that and cancels all subscriptions in your store using that Billing Agreement. But to give you maximum flexibility in working with customers, it is recommended you do not cancel the Billing Agreement. Charge the initial payment alongside the request to create the billing agreement. Charge the initial payment against the billing agreement after it has been created in a separate request. There is little difference in terms of when the customer pays or the store receives the payment between these options. Both result in a payment almost immediately. However, there are many differences in terms of how PayPal presents and stores details of the payment. No details about the initial payment are displayed to the customer when agreeing to the transaction at PayPal. Instead a billing agreement description would be displayed, and PayPal only allow one 127-character string to be used to describe the billing agreement (this description is also used on all future payments against that agreement, including for new subscription purchases and recurring payments, so it needs to be generic to avoid confusion). No line item details — individual product, tax and shipping costs — about initial payment are included in emails sent from PayPal to the customer and store owner, only total of payment. No line item details for recurring payments are included in the PayPal side of the transaction, so they are not displayed in the PayPal interface or emails sent to the customer or store owners. A number of store owners complained about this behavior. As a result, Subscriptions version 2.0.10 switched to the alternative method of charging an initial payment in the same request that creates the billing agreement. This helps ensure that line items are displayed to the customer when agreeing to the transaction at PayPal and alongside the transaction at PayPal. But this method also has a downside: PayPal appears to treat this initial payment as a separate transaction to the billing agreement, even though they are processed in the same transaction. So the amount charged for any initial payment is no longer included in the recurring total for a billing agreement in the PayPal dashboard. PayPal does not provide a way to ensure that both the initial payment information is presented to the customer on checkout and that initial payment on subscriptions products is accounted for in the total amount charged for a billing agreement/recurring amount at PayPal. There is no way to get the best of both options. Because better information is provided to the customer on PayPal Checkout with the new method, this was chosen as the best method to use in WooCommerce Subscriptions. Screenshots help demonstrate the differences between the two methods. No, PayPal provides no way for customers to check out without a PayPal account when using PayPal Reference Transactions. If you wish to allow your customers to check out without a PayPal account, there are many other payment gateways that support automatic recurring payments. Stripe or Braintree are good options. PayPal does provide a premium feature to U.S. based companies to offer Guest Checkout with PayPal Standard; but this is not available for transactions that use PayPal Reference Transactions. PayPal Express Checkout, the PayPal product that Subscriptions uses to process Reference Transactions, also offers a guest checkout option that can be set in the API request or your PayPal account. However, this option is not supported for Reference Transactions. PayPal explained this via support request; it is not published publicly in the Express Checkout documentation. No. WooCommerce Subscriptions always captures payment immediately for subscription transactions. That includes both the initial and recurring payments. If you would like authorization then capture to be supported in a future version, please submit it as a feature request on the Ideas board. 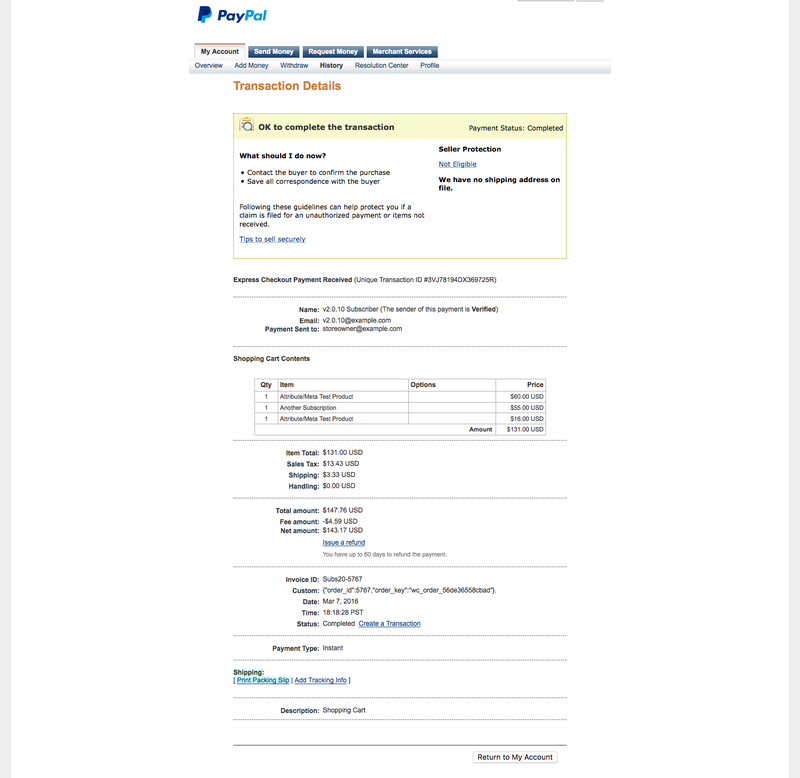 Reference Transactions use the PayPal Express Checkout product. The full name for the product is PayPal Reference Transactions via Express Checkout. To simplify setup of Reference Transactions with WooCommerce Subscriptions, once Reference Transactions are enabled by PayPal on your PayPal account, Subscriptions will use the PayPal account details already entered on the WooCommerce > Settings > Checkout > PayPal administration screen. This avoids having to duplicate the same PayPal account settings, like API credentials, on an additional administration screen. As the details on that PayPal settings screen are used for PayPal Standard purchases in WooCommerce core, and PayPal Standard Subscriptions prior to Reference Transactions being enabled, this can lead to confusion about which PayPal product Reference Transactions uses. Because of this, it will be changed in a future version of Subscriptions. How do I Enable Reference Transactions in Subscriptions? Will Existing Subscriptions use Reference Transactions? Why are billing agreements not cancelled at PayPal when a subscription is cancelled in WooCommerce? Why has the initial payment changed in Subscriptions v2.0.10? Is Guest Checkout Possible with PayPal Reference Transactions? Are Payment Authorizations Supported when using PayPal Reference Transactions with Subscriptions? Do Reference Transactions use PayPal Standard or Express Checkout?